Kid writing is pretty cute. I love the creative spelling and adorable little letters. But sometimes, a child's handwriting doesn't improve over time. It's not so cute when you can't read the night's homework assignment. You might see a child copying words or sentences and squishing all of the words and letters together in a long string. There might be no space or inconsistent spacing between letters and words. 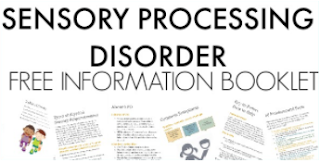 It is frustrating for the child and their parent or teacher. And it's not so cute. 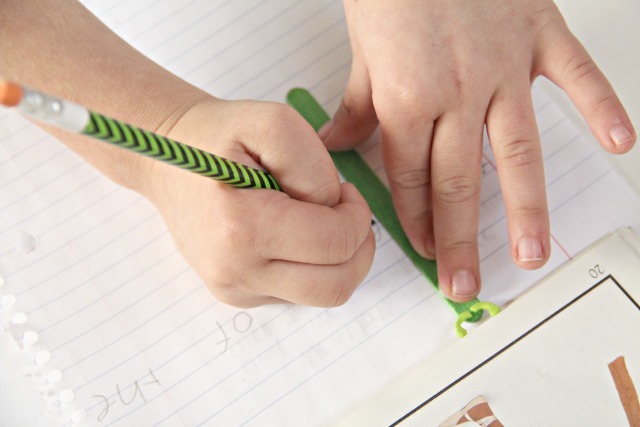 This spacing tool will help with spacing in handwriting in a fun way. My second grader and I had fun creating this Space Martian Spacing Tool and using it to practice spacing between words. 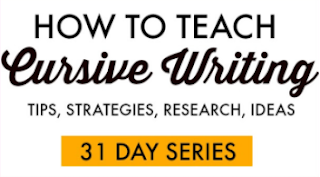 Poor spacing in handwriting can be a visual tracking problem. It could be visual inattention or poor hand eye coordination. 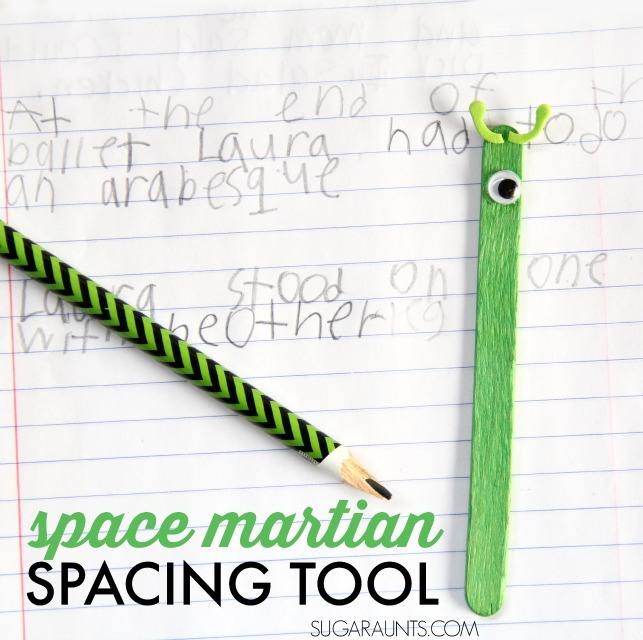 Sometimes, spacing is just something that needs more practice and a visual prompt like this space martian can help. 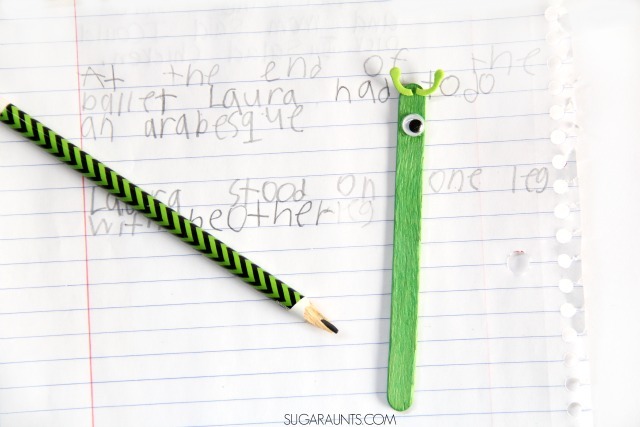 Try this easy DIY version using a craft stick to create a spacing tool pointer stick, perfect for visual perceptual needs. 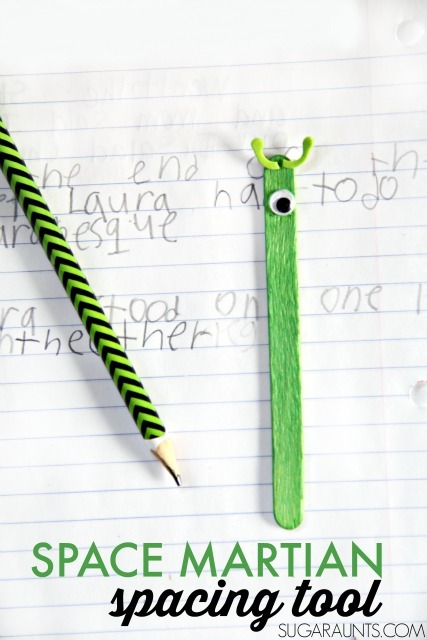 A green craft stick , one googly eye , and a sticky back foam letter sticker "C" are all you need. We received all three materials from www.craftprojectideas.com. 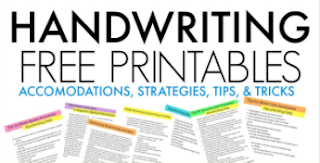 Use this handwriting spacing tool between letters and words. Encourage your child to move the spacing tool over between words. Sometimes, just that visual cue is enough to help. 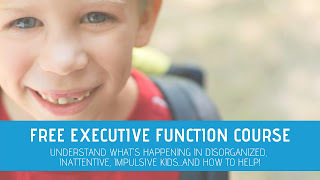 The physical act of moving the spacing tool over between words can provide enough input to a child that they become more aware of the need to space, and are able to carryover the skill without using the spacing tool.